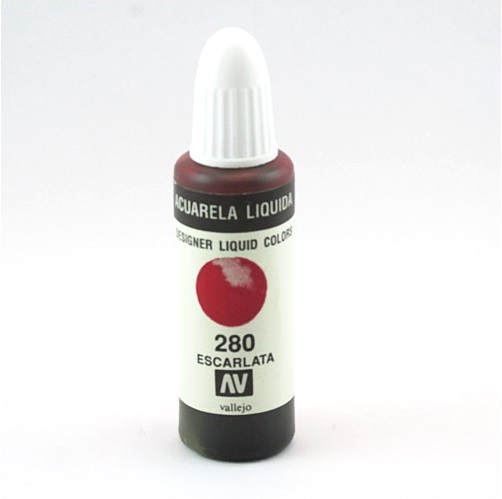 Transparent, highly concentrated waterbased colors of excepcional brillance. Designers Liquid Color is most widely used in design and illustration. The colors are formulated with permanent dyes, they do not contain pigments, they do not settle, and can be mixed easily with one another; they blend beautifully, and can be extended on large surfaces without leaving brushstrokes. The colors are clean, radiant, ideal for all graphic work. Designers Liquid Color is also used in theater design and painting of stage sets, for retouching photographs, in schools for teaching the principles of color theory, as inks for calligraphy and technical drawings and to dye paper, papiér mache and similar absorbent pastes, in combination with acrylics and inks. 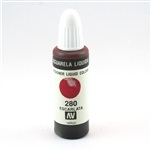 Designers Liquid Color is the best product for airbrushing because of the absence of pigment or resin particles which may clog the finer valves of an airbrush, but they are not waterproof, and their lightfastness is limited. Even the most permanent of dyes cannot equal the light resistance of artists' pigments, and may fade over the years. A final coat of acrylic varnish will protect the colors somewhat, but we do not recommend continued exposure to direct sunlight for any length of time.